Calendar 2011: Viewers' pictures illustrate each calendar month. 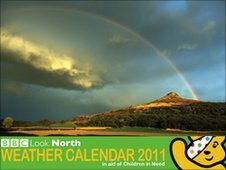 The 2011 Look North Weather Calendar is sold out. Heartfelt thanks to all those who have supported BBC Children in Need in buying the calendar. Each year the calendar features twelve of the best of our viewers' weather pictures across the North East & Cumbria.